Almost more a coming of age tale than a piece of crime fiction BLACKWATER MOON is Andy Walker’s story. He is a child of the 60’s in the small town of Blackwater in rural New South Wales and his life is not an easy one. His small family lives in a constant state of worry about what mood Andy’s father will be in at any time: the man is a violent drunk and Andy’s mother is no help to her children. Andy’s older sister collects things for her glory box knowing it will be her means of escape, while Andy takes on a job at the local supermarket to earn some pocket money and gain essential time away from the house. Things turn even darker for Andy when a person struggling with their own demons enters his young life and involves him in something that has a ripple effect for years to come. 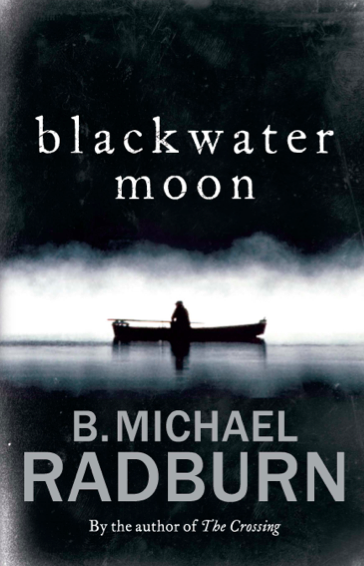 BLACKWATER MOON is Radburn’s second book after 2011’s THE CROSSING which I’ve not read. It reads like the work of a well-established author though, taking some risks with literary conventions and managing to pull them off successfully. The first person narrative works well for the kind of deeply personal story being told here and Radburn does manage to maintain Andy’s voice credibly even though it has to span the period from when he is about 10 or so to when he’s a middle-aged man. All the way along Andy’s story is a compelling one, all the more so for the understated quietness with which he travels through life. The setting – both time and place – is a strong element of the novel, though for me there’s nothing particularly Australian about any of it. I’m prepared to admit though that this might just be because I was reminded of American stories such as Stephen King’s THE BODY and Betty Smith’s A TREE GROWS IN BROOKLYN as I read. Nevertheless I do have very clear images of the town and its surrounds in my head and the portion of the book set during the time of the Vietnam war is particularly strong. By this stage Andy is married with a young baby and his wife is vehemently opposed to the war, to the point she’d rather Andy went to prison for conscientious objection than to Vietnam to fight. The suspense that builds as the couple wait to hear if Andy’s will be drafted is intense and a really superb depiction of this under-explored theme. Although many of the events depicted in BLACKWATER MOON are horrific the book doesn’t dwell on the showy, overt consequences of those horrors. Instead it shows the daily grind of living through such traumas. Andy’s story is juxtaposed with that of his tormentor at key points, someone unable to rise above the traumas of their own childhood. I’ve seen this kind of counterbalance before and it’s often awkward or incredible but Radburn didn’t overplay things and so this element did add something worthwhile to the novel. It’s quite hard to talk about this book because there is so much I would consider a spoiler. I was lucky enough to come to BLACKWATER MOON with absolutely no preconceived ideas about it and I think you should get to do the same should you care to. I found it a gently compelling novel, with a terrific central character and several genuine surprises.